First installation of the new higher performance Hartzell prop on a European registered aircraft was performed at the Socata North America, Inc., Service Center in Pembroke Pines, Fla.
Piqua, Ohio, March 31, 2014 – The European Aviation Safety Agency has validated Hartzell Propeller’s Supplemental Type Certificate for installation of advanced swept airfoil structural composite five-blade propellers on TBM 700/850 aircraft. First installation of the new higher performance Hartzell prop on a European registered aircraft was performed recently at the Socata North America, Inc., Service Center in Pembroke Pines, Fla.
“Hartzell Propeller’s newest design for the TBM turboprop results in faster takeoff acceleration, higher cruise speeds and better climb, along with less noise, all extremely important for European flying,” said Hartzell Propeller President Joe Brown. With the new Hartzell propeller, the TBM’s takeoff acceleration from zero to 90 knots is 10 percent faster than with any other available propeller. Hartzell’s new propeller also provides for a couple hundred-feet-per-minute faster climb rate. Cruise is two knots faster than the Hartzell four-blade metal prop, and a full five knots faster than a less-advanced five-blade wood-based propeller option. The new Hartzell five-blade prop is also significantly quieter in the cabin and in the pattern. It has no placards or restrictions allowing low/high idle operation. Hartzell received FAA and European Aviation Safety Agency (EASA) Type Certificate (TC) approval for the propeller in 2013. Hartzell offers the new prop with a “Plus 3” warranty, which covers the propeller for a full three years or 1,000 hours, and a 3,600-hour/six-year TBO (Time Between Overhaul). The new propeller is available directly through Hartzell’s Top Prop conversion program (www.hartzellprop.com) or through DAHER-SOCATA’s distributor network: (tbm850.com/Support-Network). Hartzell’s proprietary resin-injected carbon fiber blades are five to 10 times stronger than beech wood and spruce construction. The thinner airfoil, which is possible due to carbon fiber’s greater strength, makes the improved TBM performance possible. The new five-blade design features a state-of-the-art composite wedge retention into its stainless steel alloy shank rather than aluminum and lag screw construction used in wood based propellers. Hartzell incorporates an innovative nickel erosion mesh and field replaceable nickel-cobalt erosion shield to prevent foreign object damage to its unlimited life blades. DAHER-SOCATA’s TBM 850 is the world’s fastest single turboprop aircraft, with a maximum cruising speed of 320 KTAS at Flight Level 260 (in ISA conditions). It combines cruising speed and trip times of a light jet with the economic direct operating costs, range and moderate environmental signature of a turboprop engine. The maximum range and useful load – which are enhanced on the current version – as well as the ability to land at small airports, are some of its customers’ favorite features. TBM 850 Elite offers owners the unique capability of tailoring the cabin to host four or six persons on board. 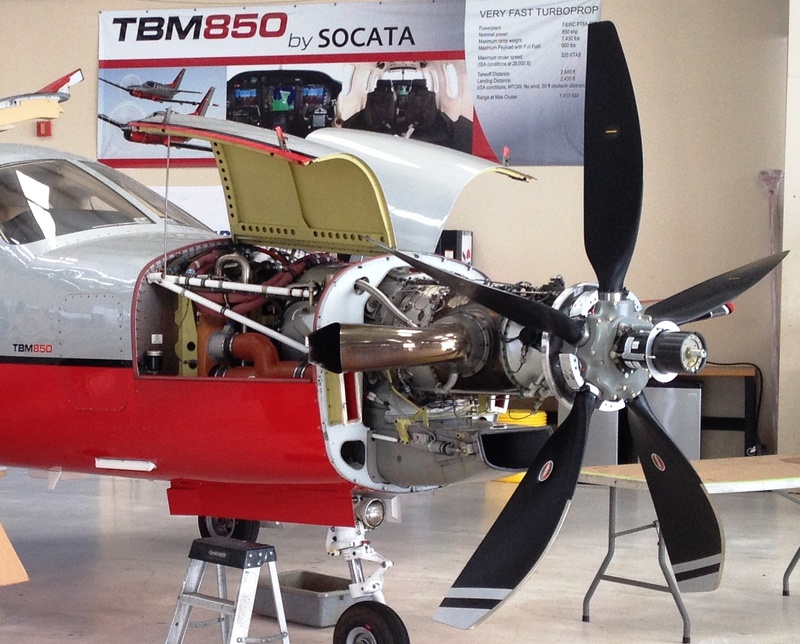 Since its launch in 2005, the TBM 850 has become an international success, with 338 units delivered as of Dec. 31, 2013. As of that date, the overall TBM 700/850 fleet – totaling more than 662 aircraft – exceeds 1.1 million flight hours. Hartzell Propeller is the leader in advanced technology propeller design and manufacturing with more than 3,700 propellers delivered annually to business, commercial and government customers. The company developed the next generation of propellers with innovative “blended airfoil” technology. It manufactures these blades using a combination of revolutionary machining centers and robotics. With its ASC-II™ composite technology, Hartzell provides mission-optimized performance for customers. Hartzell Propeller traces its beginnings in 1917 to a business relationship with Orville Wright and was founded on the principle of “Built on Honor” – a tradition that continues today.